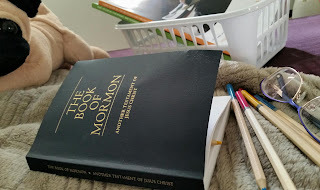 Most likely you are one of the amazing women who heard our prophet ask us a few months ago to start and finish the Book of Mormon by the end of the year, and then to share our experiences. 😀 So, I've been reading on Facebook for the last week all about your special experiences while taking on that challenge. I loved the hug that President Nelson gave those of us who didn't finish this particular race, when he said "I hope that each of these invitations has brought you closer to the Savior. If you have struggled with any of them, please don’t be hard on yourself. You can start today. The Lord is happy with any effort we make to draw closer to Him." 💓 This is Love! This is Christlike Love! No condemnation. Just loving encouragement and validation for what efforts we have and will put forth. I feel blessed to be led by a man who leads in this way. So, I started today to read The Book of Mormon and finish it by the end of the year. I am following a cute little calendar I found online. And Leif and I started to read The New Testament together. What a peace the scriptures bring into our lives.